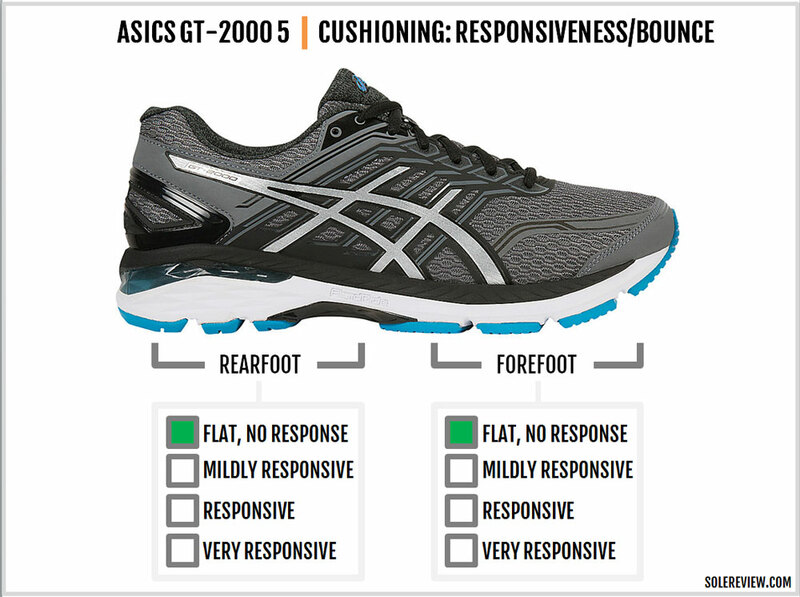 Asics’ marketing pitch: For the high-mileage runner looking for structured cushioning and support. Upper: Air mesh, fused and stitched synthetic leather, plastic heel counter. Midsole: Triple density compression molded foam, Gel pad inserts, plastic shank. 10 mm heel offset. Widths available: B-narrow, D - regular (reviewed), 2E - Wide, 4E - Extra wide. The GT 2000 5 has only minor changes over the GT 2000 4. Except for the smoother upper interiors and slightly snugger forefoot, it’s hard to tell the two versions apart. The ride character is identical and produces a mild motion-control behavior. This review is going to be fairly straightforward, because well, there isn’t a lot to talk about. 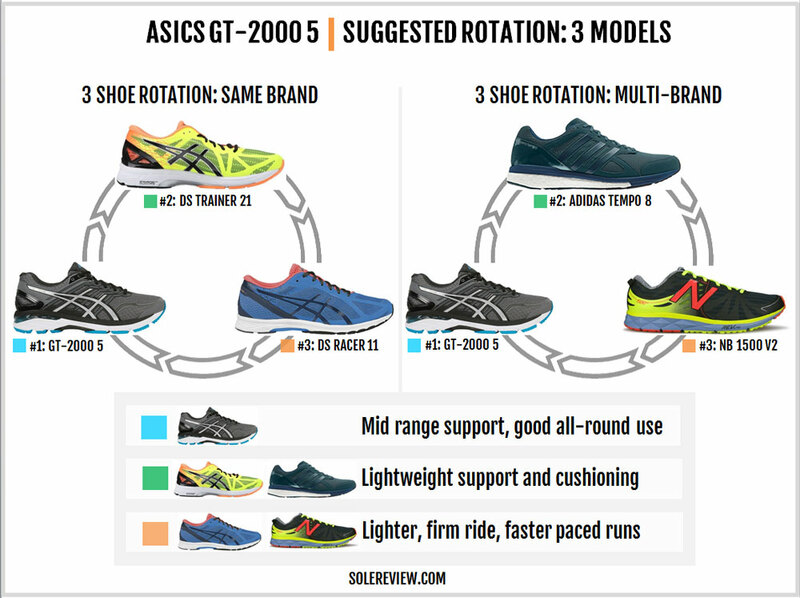 The 2017 Asics GT-2000 5 feels a lot like the GT-2000 4, and that’s expected considering that both versions share an identical midsole and outsole set-up. All the changes occur on the new upper which adopts no-sew layering to a greater extent than the GT-2000 4. This results in a couple of things. The insides fit smoother, and the forefoot fit is marginally snugger due to the reworked placement of the midfoot Asics logo. And as if to compensate for the forefoot design, the heel has slightly more structure than the GT-2000 4. There you go. That’s all you need to know about the GT-2000 5 if you already own the V4. Sometimes it makes more sense to throw everything upfront so that you don’t have to scroll down the lengthy review. The rest of the review is for those who are new to the GT-2000. In which case, we’ll begin with a brief introduction. 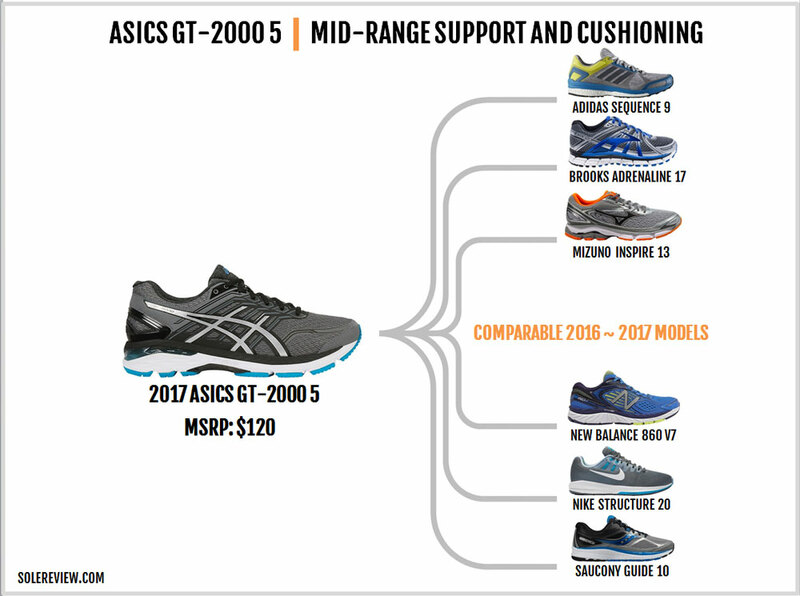 The GT-2000 is Asics’s mid-priced support model. In other words, this shoe has a firmer inner midsole and a softer outer side with the intent of controlling foot-roll. Most shoes in this category feature a medial post, a piece of wedge which is firmer than the rest of the midsole. Going by the name, it would seem that the GT 2000 is only in its 5th year, but this concept has been around for much longer. At a conceptual level, the GT 2000 is the replacement for the venerable GT-2160. Coming to think of it, the GT 20xx series has been around since 1993. Old timers, you do remember the GT 2020 and 2030, don’t you? The support shoe category is populated with numerous options across brands. Some variations offer the firmer medial post, while others don’t. Among the medial-post featuring shoes, the well-known models are the Brooks Adrenaline GTS 17, New Balance 860V7, Nike Structure 20, and the Saucony Guide 10. 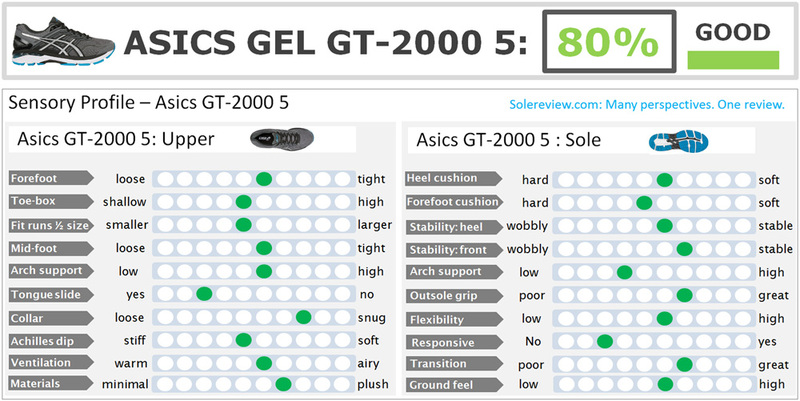 The GTS, Structure and the Guide ride firmer than the GT-2000 5 due to the use of firmer midsole foam. The 860V7 is comparable to the GT 2000 in a few aspects, except it has a different fit quality and is much lighter. Other models offer multiple variations of the support midsole concept. The Sequence 9 has a Stableframe midsole with mild medial support; the Inspire’s Wave plate makes the shoe stable by default. Lastly, the severely under-rated Skechers GoRun Forza 2 is an excellent shoe which balances cushioning and support well. 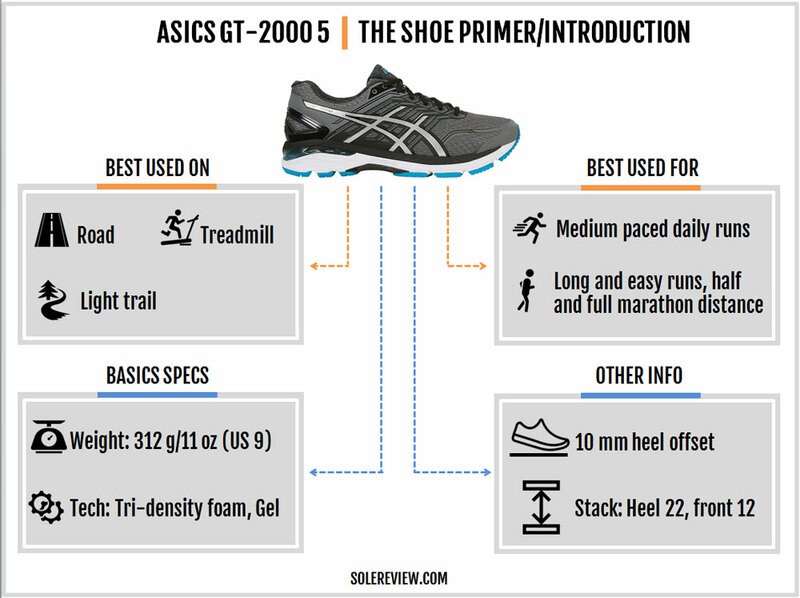 The GT-2000 5’s upper is based on the standard Asics template. The toe-cap is stitched over the spacer forefoot mesh, just like the GT-2000 4 was. 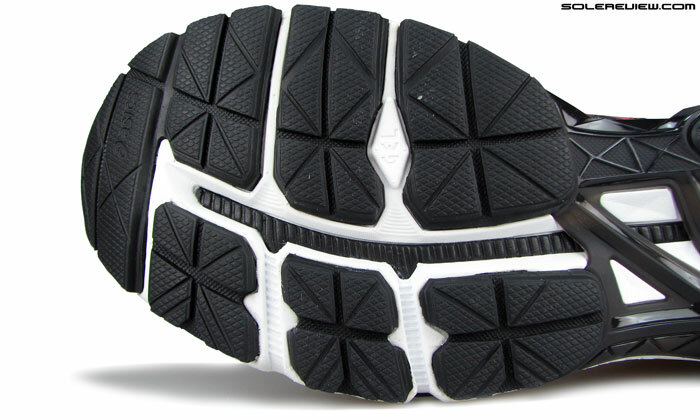 A pair of fused overlays run over the forefoot and connect the toe-bumper to the midfoot. The synthetic midfoot panels are now attached to the upper using no-sew welding, as opposed to the stitched construction of the GT-2000 4. Although the previous GT used fused layering, the new GT 2000 5 increases its usage of welded panels. For example, the medial midfoot of the GT-4 was a stitched panel. This year, that’s changed to a no-sew type. These external updates aren’t merely cosmetic. Eliminating the stitched panels also removes the stitching inside, making the interiors smoother than before. The tongue is standard Asics design, which is a euphemism for a sleeve-less construction which causes the tongue to slide. And for reasons unknown, the reworked tongue is shorter than the GT 2000 4. The length falls short when one has to use the last row of heel-lock lacing. There is a new lining mesh for the tongue, which is also used on the heel collar. While the basics haven’t changed – like the generously foam padded heel with a narrow molding – the mesh lining is new for 2017. Part sharing with the GT 2000 4 isn’t just limited to the midsole and outsole. The external plastic heel counter is carried over from the previous model sans any changes, down to the tiny bit of reflectivity affixed over it. 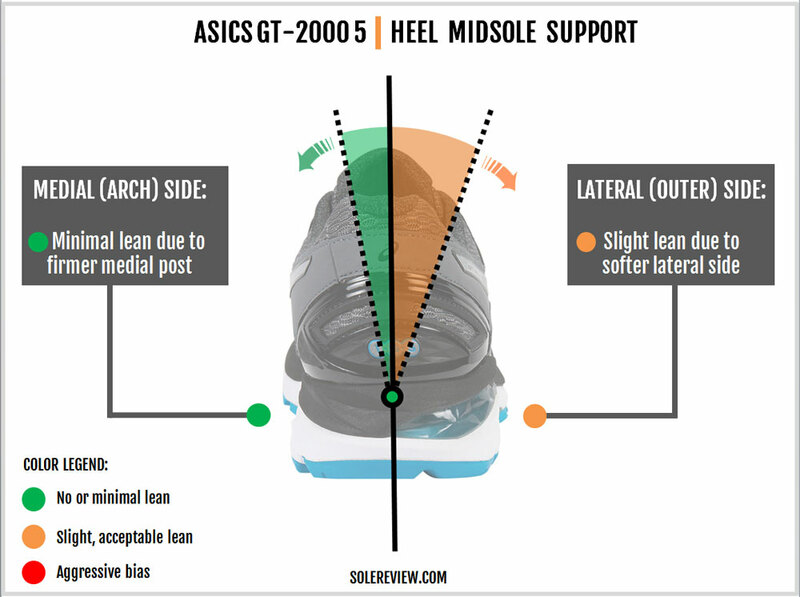 Regardless of the identical heel counter, the GT-2000 5’s heel has increased structure. The synthetic strip wraps above the plastic heel counter, hence making the Achilles area firmer than the previous GT. It’s slightly unusual for Asics to carry forward midsole designs from a previous model. 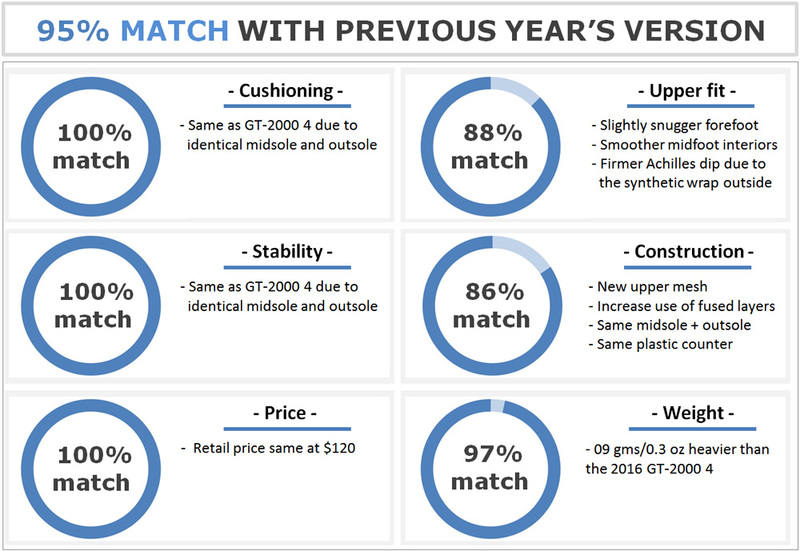 In the past, annual updates were accompanied by a midsole and outsole makeover, and this has been historically true for the GT series as well. There could be a couple of reasons behind this aberration. Perhaps Asics has realized the financial prudence of biennial design refreshes; after all, new molds are expensive to produce. 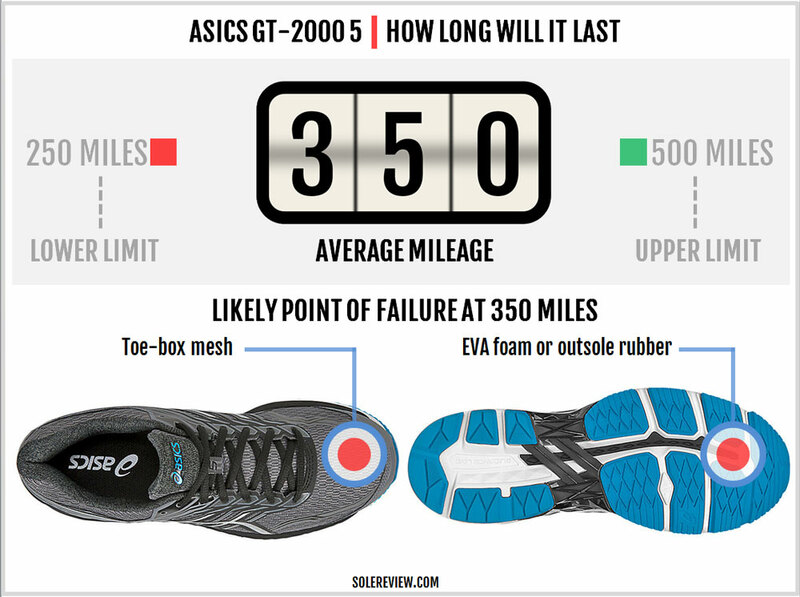 The other probability is that the GT-2000 is due to be equipped with a Flytefoam EVA midsole (like the Kayano 23 and Nimbus 19), and the new GT concept is running behind schedule. If the latter theory is true, then the GT-5 is nothing more than a stop-gap arrangement. 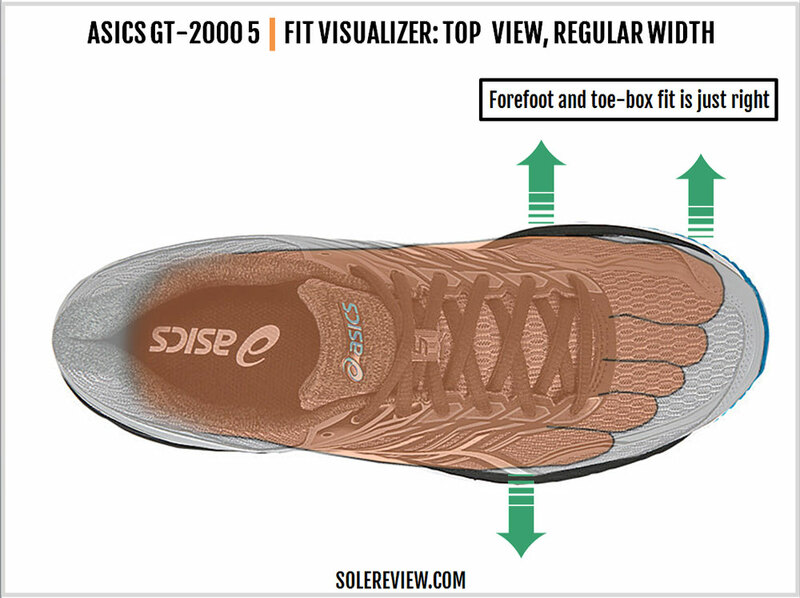 Like the GT models before it, the GT-2000 5 features a triple-density midsole. The primary midsole stack is made of a soft foam (in black) over a firmer (in white) base. 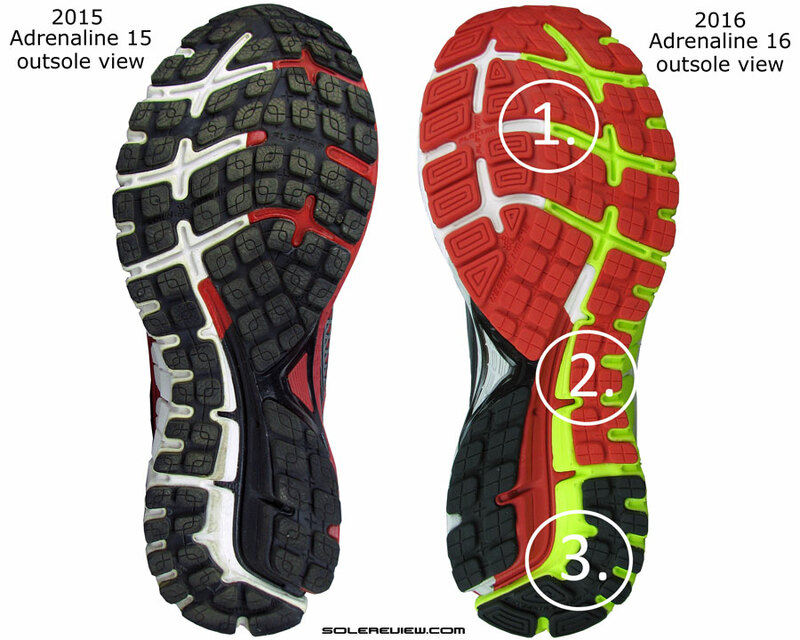 A visible Asics Gel pad is sandwiched between these layers under the rearfoot. The forefoot has a Gel pad too, but it’s a small dime-like piece concealed within the midsole. 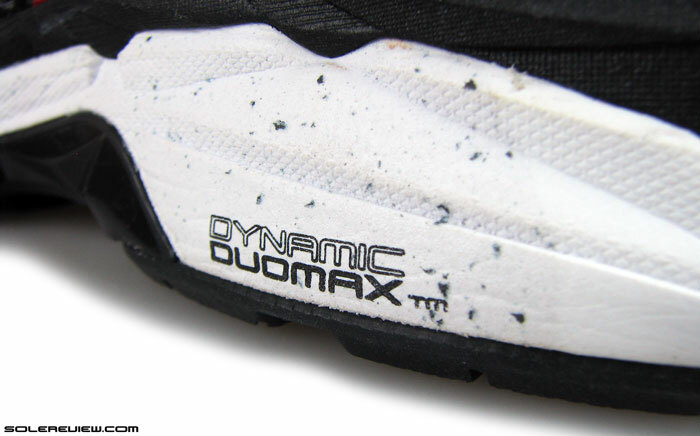 The firmer foam wedge – which Asics calls the Duomax – is embedded into the medial midsole. The outsole geometry has all the familiar components. The rearfoot has multiple pods of hard carbon rubber while the forefoot is covered with softer blown rubber. A plastic midfoot shank bridges the front and rear, and a transition groove named the ‘Guidance line’ splits the outsole into longitudinal halves. There are plenty of flex grooves, so the forefoot is moderately flexible. 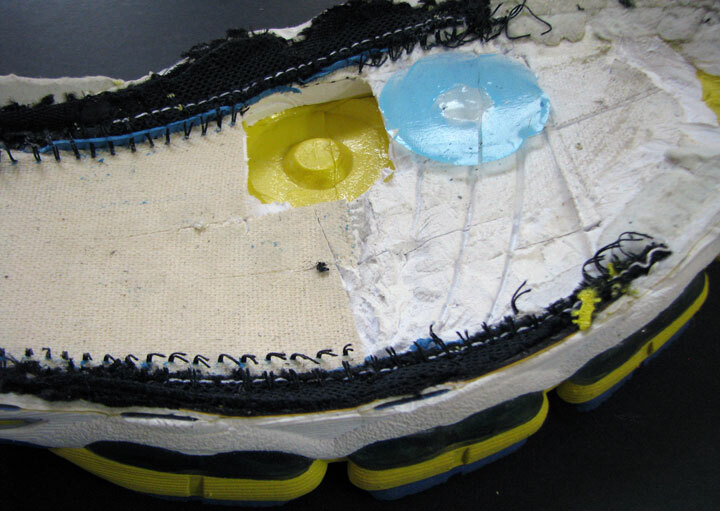 Inside the upper, the insole is removable, molded, and is based on a soft blown foam layer. 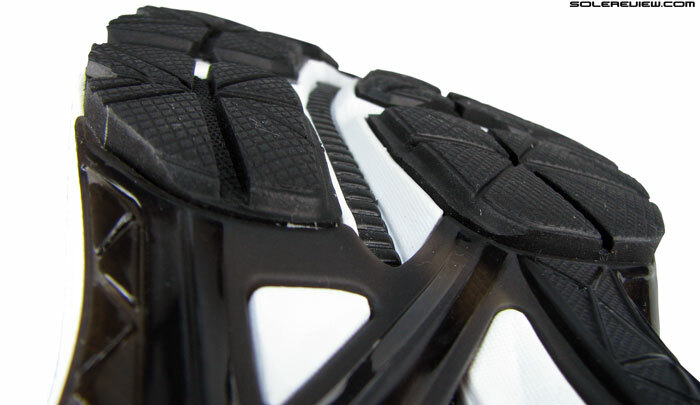 This insole is the first line of cushioning, followed by another sheet of lasting foam just below it. This might be the right time to point out that the women’s GT-2000 5 is softer than the men’s model. All things being the same, the upper midsole layer (in black) is relatively softer on the women’s GT-2000. The GT-2000 5 fares reasonably well on the durability scale. Be it the upper or outsole, there is plenty of structure on the GT. 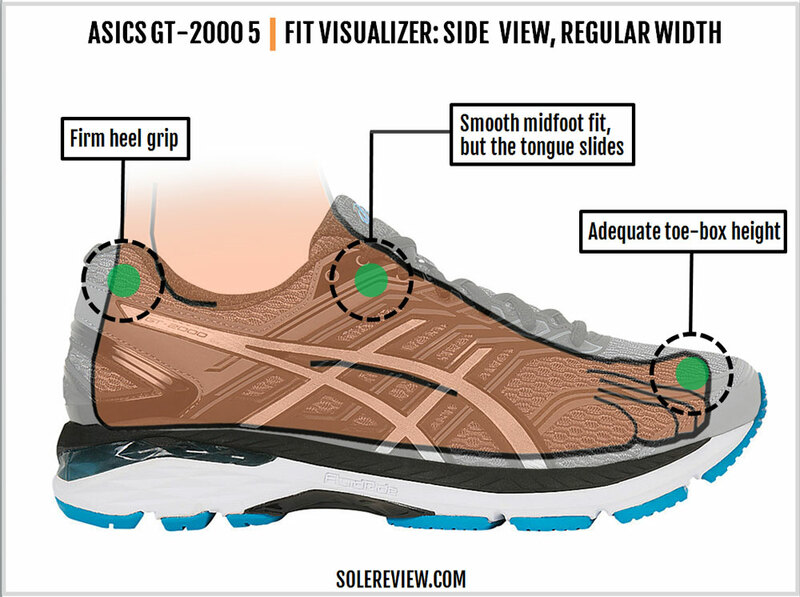 Some of the issues which can potentially shorten the GT’s lifespan would depend on your foot type and gait. For example, there are reports of the forefoot outsole experiencing accelerated wear – this is the part made with the soft blown rubber. The toe-box mesh could undergo wear and tear due to friction with the big toe. This is subjective to the fit relationship with individual foot anatomy and the shape of the toe-box. And as the GT’s midsole is made of standard EVA foam (Gel is only a small component), its cushioning properties will degrade over time. In a certain way, the new GT’s upper fits better than the last edition. That’s because the outer midfoot panels now completely bypass stitching. This makes the GT-2000 5’s interiors smoother than before. There aren’t perceptible fit changes made to the toe-box. The stitched bumper construction has always proved to be space-friendly, and the GT is no exception. There’s enough vertical room available inside. Given that the external plastic clip is identical to the last one, the heel has the same level of hold. The GT’s heel fit is delivered by the combination of the narrow molding and the foam-filled mesh lining. The top part feels slightly firmer due to the synthetic leather extension wrapping the back, but does not cause discomfort. The forefoot fit is nearly the same as the GT-2000 4, save for the slightly snugger feel on the sides. 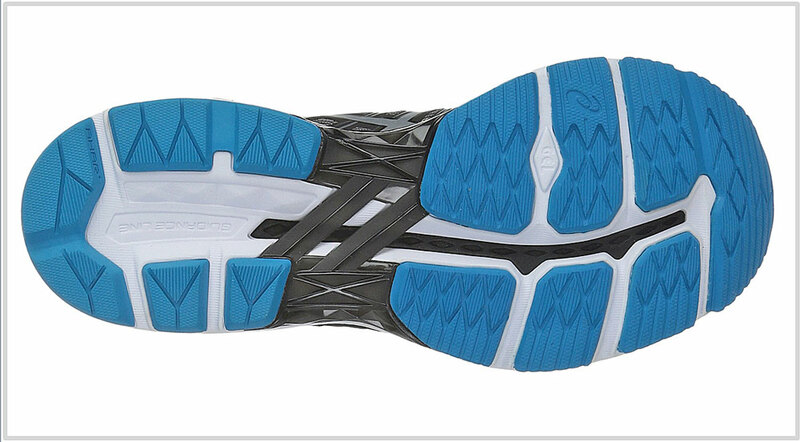 One end of the GT-5’s molded Asics logo extends further into the forefoot when compared to the GT-4. The toe-box is wide, as befits a stitched toe bumper design. The GT-2000 5 also exhibits better flexing behavior over the forefoot. Asics has replaced the stitched piece under the first lacing row with a fused strip, so the top feels more comfortable over the foot. Length-wise sizing fits true for the GT-2000 5. Most of the GT-2000 5’s softness comes from the upper layers consisting of the insole, foam lasting, and the top midsole. The under-heel cavity and side Gel windows also provide cushioning to a certain extent, so the softness comes across as rearfoot loaded. The midsole isn’t overly soft; it strikes the right chord between firm and soft. As such, the GT-2000 can be used for daily training or even running marathons, all without the mushy sensation. And as pointed out earlier in this review, the women’s GT is a bit softer than the men’s model. 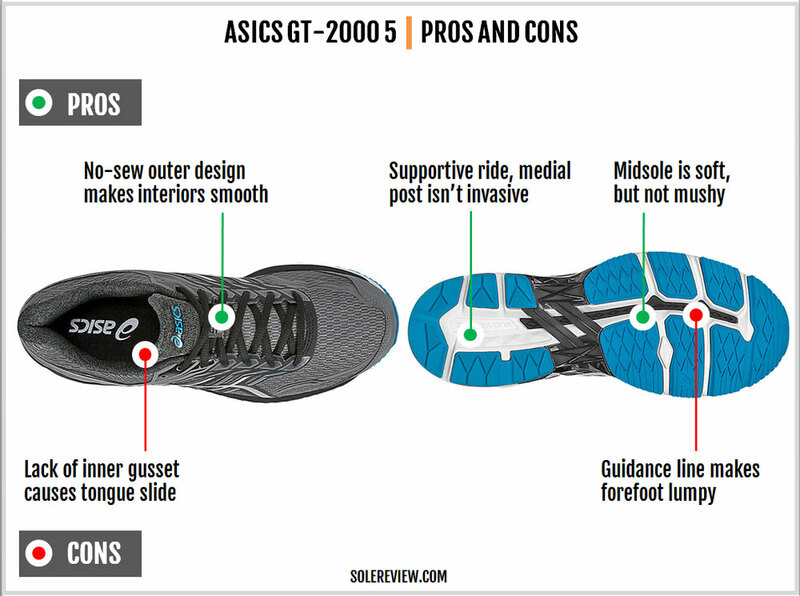 If there’s one area where the GT-2000 (and many other Asics shoes) could improve, that would be the Guidance line design. Asics’s transition groove extends all the way to the forefoot, where it splits the lateral and medial outsole into two halves. As a result, the Guidance Line under the forefoot exposes the softer upper midsole foam. The zone under the forefoot feels lumpy, as the edges of the outsole rubber press into the Guidance line during footstrike or roll-offs. In essence, the Guidance line works well when the midsole is very firm and resists compression. On softer shoes, this is a problem. The right way to do the Guidance line would be how Brooks does it. If you look at the Adrenaline GTS’s outsole, the transition groove extends all the way to the forefoot but is bridged by outsole rubber instead of cutting clean through. As with most Asics midsoles, the ride doesn’t feel bouncy. You get softness from the compression of the dual-density foam stack, and that’s it. 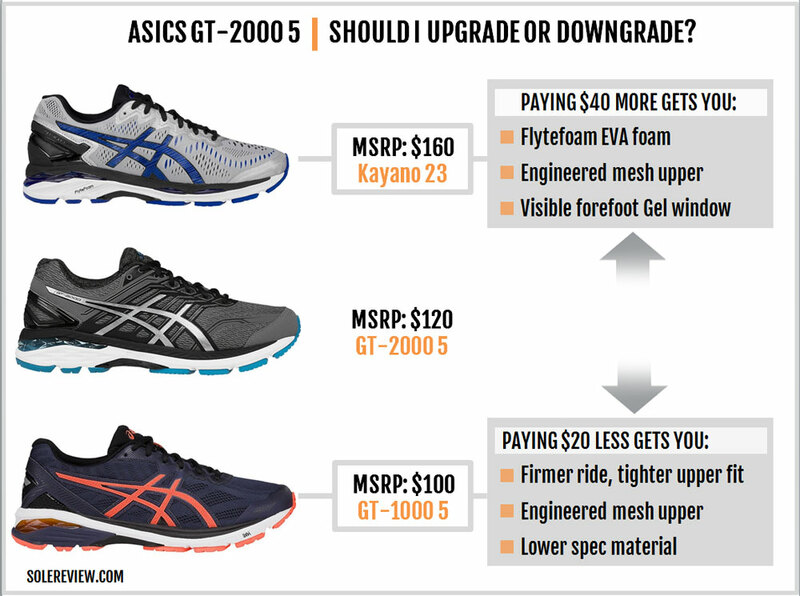 Some newer Asics shoes like the Dynaflyte perform better on responsiveness, but even those models don’t compare to newer compounds such as adidas Boost or Everun. Under the heel, the outer midsole is designed to produce increased softness as compared to the inner side. On the lateral midsole, two kinds of foam sandwich a visible Gel unit. On the inner side, there’s a medial post. So the GT-2000 5 has an outward lean expected of a motion control shoe. Not something to worry about, though. Transition quality is average on the GT-2000. Ironically, it’s the Guidance line which gets in the way. By splitting the forefoot into two side-by-side halves, the roll-offs and progressions don’t come as quick. Add to that the overall softness of the midsole, and the midfoot gap which impacts the heel-to-toe transitions. In short, the GT-2000 isn’t sluggish, but unsuitable for faster paces. Please see our rotation section for ‘faster’ alternatives. The GT-2000 comes with standard Asics goodness, such as a well put together upper and a structured midsole. Design elements like the stitched bumper create a high and wide toe-box profile, and the multi-density midsole delivers a balanced ride quality. The interiors have an improved, smoother fit quality due to the fused midfoot panels, and the heel fits well. The traditional shoe-making approach which makes parts of the GT-2000 good also brings with it a few flaws. The sleeve-less tongue produces sideways slide, and strangely, the tongue is shorter this year. Also, there’s nearly no reflectivity on the GT-2000. Things could also be better underneath. The Guidance line which runs the length of the shoe turns the forefoot ride lumpy; the corners of the rubber lugs are felt during roll-offs. 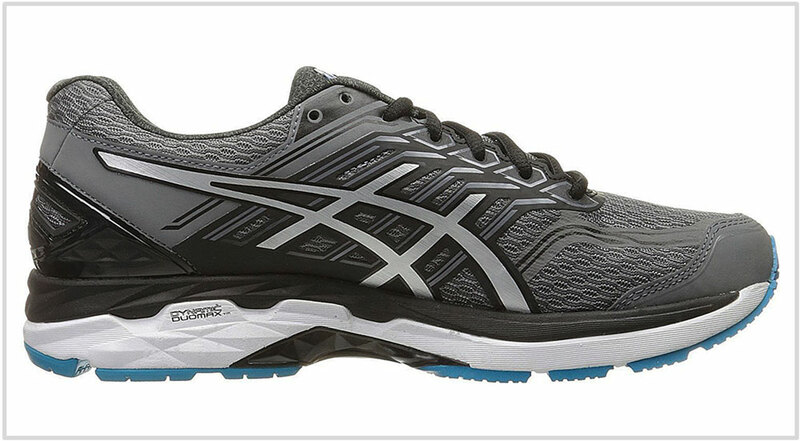 The DS-Trainer has long been Asics’s go-to shoe for faster-paced workouts and even races. Like the GT-2000, it has a medial post but a much smaller one. The DS’s lightweight and firmer build make it a suitable rotational shoe along with the GT-2000, capable of quick runs and races up to a marathon. Don’t get us wrong. The GT-2000 is great for daily training but feels lacking during fast days. For shorter races, the DS Racer 11 fits in perfectly with the GT-2000 and DS Trainer. Even lighter than the DS, the Racer 11 is a good shoe to have for shorter races of 5K or 10k distances. 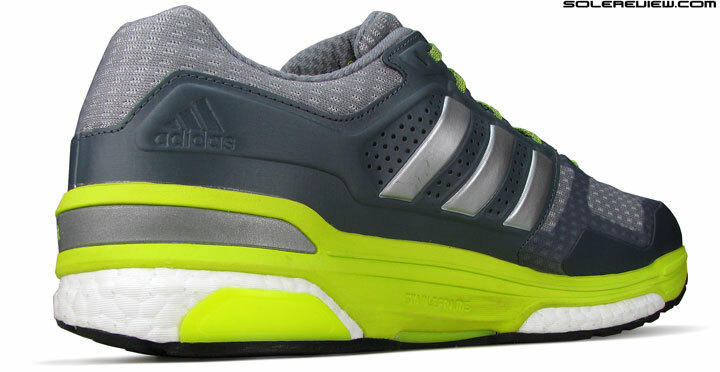 Other than Asics, the adidas Tempo 8 or Boston 6 will stand-in for the DS Trainer. The Tempo 8 is a firmer shoe with medial-side support, whereas the Boston 6 is cushioned yet supportive enough for a neutral trainer. The New Balance 1500 V2 is more nimble than the Boston or Tempo and is worthy of consideration. Else, the Brooks Asteria is an alternative. Nothing has changed as regards the ride quality. Everything below the upper is the same as the previous model, so expect the exact ride quality – be it the amount of cushioning or stability. There are minor changes on the GT-2000 5’s upper fit. The interior feels smoother due to the switch to no-sew midfoot panels, while the forefoot is marginally snugger due to the repositioned Asics logo. From a structural and material standpoint, the GT-2000 gets a brand new spacer mesh and increased material around the heel area. The tongue and collar lining have changed, and the tongue length is shorter than the GT-2000 4. The new GT is slightly heavier than the GT-4. The weight difference is a mere 0.3 ounces or 9 grams, an increase which has no real-world effect on performance. Within the support category, the GT-2000 5 sits midway between the GT-3000 4 and cheaper GT-1000 5. That said, the GT-3000 is pretty close to the GT-2000 in features and benefits, and the mere $10 MRSP difference is a clear signal. You’ll only get a real bump-up in cushioning softness and the quality of upper materials with the Kayano 23. 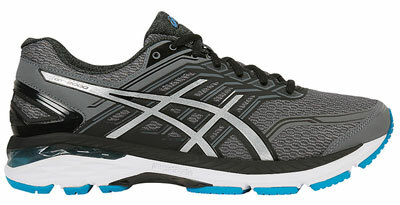 For $40 more over the GT-2000, the Kayano offers a much softer ride and materials with a better feel. But the GT-2000 does everything well enough, so we really don’t see the need to spend so much money – unless you’re getting a good deal on the Kayano. The GT-1000 5 is a toned-down 2000, and you can literally feel the difference in the form of lower-spec materials and the firmer ride. It makes more sense to get the GT-2000 5 for $20 more, or buy the outgoing GT-2000 4.